Jean Perras supervised activities at the site and worked with authors of Isthmia studies and final preparation of manuscripts on the arms and armor, Rachi Settlement, Classical and Roman Pottery, and coins. Pottery from the Sanctuary of Poseidon: Late Archaic and Classical periods, ca. 550-300 B.C. Preparation of illustrations, review of drawings by Evgenia Doschori, new photographs and checking of catalogue. Alastar Jackson reports that the final results show that by the time the Archaic Temple burned down (ca. 450 B.C. 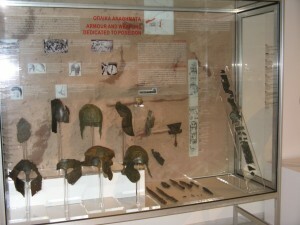 ), it had accumulated a minimum 32 bronze-rimmed shields and at least 30 sets of shin guards, as well as more than the 225 bronze helmets and over 100 iron weapons. The presence of thousands of fragmentary metal scraps dumped north and east of the temple after the usable metal was recycled suggests that the sanctuary probably received scores more armor and weapons. Hardly any of these are likely to have been manufactured after the time of Xerxes’ invasion (480 B.C.) Afterwards, dedications reported for the Isthmus are only of spoils from non-Greeks: Persians, Phoenicians and Carthaginians. Jackson, with the geologist Christopher Hayward and Jonathan Stevens, explored the Rachi plateau beyond the excavated part of the original settlement to establish the settlement’s original extent and to estimate the possible scale of fighting on it in an engagement of 198 B.C. No ancient rock-cut structures were identifiable, even in areas not damaged by modern quarrying. Over much of the flanks of the ridge and in parts of its surface numerous traces of pre-modern, i.e. ancient, quarry workings were identified, extending over 1 km. from the tip and over a maximum width of 300 m. It is likely that the French archaeologist Paul Monceaux in the early 1880s mistook all the ancient quarry cuttings beyond the excavated area as structural and as evidence of a kilometer-long town. If this explanation is correct, then the original Hellenistic settlement, though now damaged by modern quarrying, will not have been very much larger than the small surviving excavated area (perhaps at most twice or three times as big). Hemans’ study of the temple is being prepared for publication by his former student, Jonathan Stevens. Formatting of Geagan’s text, updating, corrections in relation to site records and autopsy of the stones were completed. For personal reasons Liane Houghtalin has given up her study of the coins. The excavation is grateful for her fine work on the material.